Wurth Portable Edgebander provides woodshops a convenient, fast and effective means for the application of non-preglued edgebanding in an affordable unit. The CBC.E edgebander utilizes a hot melt pellet adhesive system for PVC, ABS, wood, paper and other similar materials. The Wurth Portable Edgebander uses a hot glue process for adhering edge banding such as PVC, wood veneer, ABS, polyester and acrylic that do not have a glue backing. Our portable edgebander utilizes edge banding tape with a maximum height of 3" (80 mm) and a tape thickness of 0.3mm to 2mm. 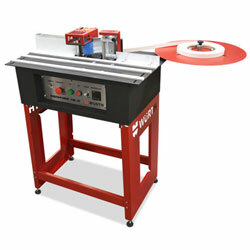 The integrated manual cutter offers precise cutting of the edge banding tape. With a digital control temperature panel and glue pot with the capacity of 1.5 pounds (700 grams), this edgebander is a game changer for any small to medium sized cabinet shop that has found the cost of larger edge banders to be prohibitive. The Wurth Portable Edge bander is easy to assemble, heats up in 15 minutes, and is easy to use. A spiral glue bar raises the glue from the glue pot for a clean and easy tape application. Safety of our unit is paramount and the electronic power panel consists of a master on/off switch, hands-free emergency shut-off switch, glue pot on/off switch, feeder switch and digital thermostat. The digital thermostat for this edgebander is pre-set at the factory to 170° Celsius and is easily adjustable from 120° to 220° Celsius, depending on your edge banding glue choice. Wurth recommends glues that work in the range of 160° up to 190° Celsius and offers Jowat hotmelt glue perfectly paired to this device for your shop needs. Adjustments for height and width of edge tape can be made easily and you can also adjust the hotmelt glue flow rate. Our Wurth Portable Edgebander includes safety features like an emergency button, which will instantly shut down all machine controls, and a feeder switch, which activates the feeder (rubber and glue axis). This switch will only activate the glue bar after confirming your edge banding glue reaches a pliable state. Minimal cleaning and maintenance are required to keep this edgebander running smoothly. This edgebander runs on 1,500 watts - 110 Volts - 1-Phase standard receptacle; meaning, no unusual electrical requirements are necessary making it ideal for flexible woodshop requirements including job site use. If you are looking for an affordable edge banding solution for your woodworking shop, then our portable model offers a very compelling opportunity for smaller shops to start edge banding in-house with their own machine. This unit offers a one-year manufacturer’s warranty backed up by Wurth McFadden’s Canada. • Power: 110V, 1500 Watts. • Maximum tape height: 3". • Tape thickness: .3mm to 2mm. • Feeder Speed: 18 ft./min. • Glue pot capacity: 1.5 lbs. • Approximate Heat-up Time: 15 minutes. • Digital Thermostat preset: 338°F. • Thermostat Range: 248°F to 428°F. • Recommended Adhesive Temperature Work Range: 320°F to 374°F.